Paperback, 9.5 x 12.5 in. / 88 pgs / 56 color. In the late 1960s, Lee Lozano (1930–99) conceived of and executed a series of "language pieces," written in the pages of her notebooks, consisting of rules and parameters for the actions that would constitute a piece. 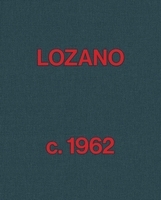 From offering money to houseguests to smoking as much marijuana as possible, Lozano boldly tested social norms, culminating in two of her most famous works: General Strike Piece (1969), which saw her retreating from the art world completely, and Decide to Boycott Women (1971), in which she ceased engaging with all members of her own gender. 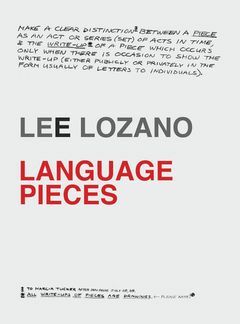 Lee Lozano: Language Pieces presents 46 of these pieces, beautifully reproducing them at full scale. Nearly five decades later, these radical manifestations of 1960s and '70s conceptualism continue to exert their political and artistic influence. Text by Helen Molesworth, Bob Nickas. FORMAT: Pbk, 9.5 x 12.5 in. / 88 pgs / 56 color. 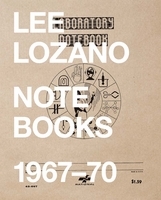 Published by The Fruitmarket Gallery/ Hauser & Wirth Publishers.